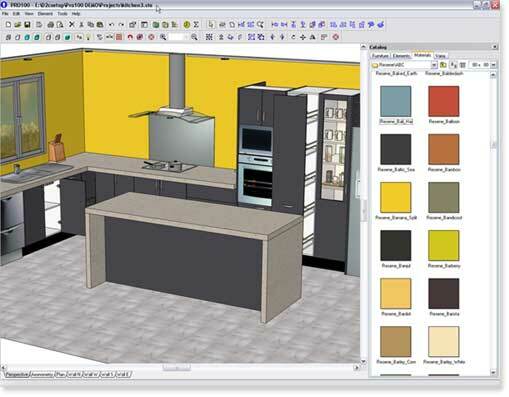 Design2Cam Design software developed for the manufacturing industry, from cabinetmakers, kitchen and joinery manufacturers to designers, includes an extensive range of Resene swatches in jpg format to enable splashes of Resene colours to be effortlessly added to professional designs. Available under the brand name PRO100, the software is described as user friendly and very intuitive, enabling specifiers and manufacturers to produce stunning professionally presented designs. It includes libraries of the cabinets, appliances, objects and the hardware you need to build kitchens, wardrobes, bathrooms, living furniture or office fitouts. Just choose, drag and drop, then stretch as desired. Or you can create your own cabinets, objects, appliances or hardware, building them on screen part by part, just like you do on the factory floor. Plans, elevations and 3D perspectives, zooming and rotating at will. Change colours and textures with a click of the mouse, and then show your client what the finished project will look like and secure the sale with a photo-realistic view. The software is complemented by PROCentre and PROCentre Advanced to produce the correct manufacturing and pricing information and provide output files for linking to a number of other software packages. For more information see Design2Cam's website.